It’s rained again…. What should I do about nitrogen? With continued precipitation and water lying on fields in many areas, growers are becoming concerned about nitrogen loss. This article will explain how to determine if N loss from excessive rainfall has occurred and what corrective measures may be taken. Once N is in the soil, nitrate is the form of N that can be lost via leaching or denitrification. Nitrogen in the form of ammonium or organic-N will not be lost. The first step is to determine how much of your applied N may be nitrate. It takes 1 to 2 weeks for ammonium forms of nitrogen to transform to nitrate, while it takes 1.25 to 2.5 weeks for urea, and 3 to 8 weeks for anhydrous ammonia. Urea ammonium nitrate, UAN (28% or 32%), is 50% urea, 25% ammonium, and 25% nitrate. This means that 25% of the N applied in UAN may be lost immediately. Nitrate leaching will occur when precipitation (or irrigation) exceeds the soil’s ability to hold water in the crop root zone. Leaching is a much bigger issue on sandy, coarse-textured soils that typically hold 1 inch of water per foot of soil compared to medium- and fine-textured soils that hold 2.5 to 3 inches of water per foot of soil. To determine if nitrate could leach out of the root zone, compare the rainfall totals in your area to the number of inches of water that your soil can hold in the crop root zone. Losses of N through denitrification can occur on medium- and fine-textured soils when the following conditions are present: 1) N is in the nitrate form. 2) The soil is saturated with low oxygen content. A glistening soil surface can indicate soil saturation. The longer the soil is saturated the more N may be lost. 3) Denitrification proceeds faster on warmer soils, especially when soil temperatures are greater than 75°F. The following is an example of how length of time the soil is saturated and soil temperature impact N loss. When soil temperature is 50°F, 3% of the nitrate may be lost when the soil is saturated for 4 days compared to 6% lost when saturated to 10 days. By comparison, when the soil temperature is 75°F, 20% of the nitrate is lost after 4 days of saturation and 43% is lost after 20 days of saturation. Keep in mind that soil saturation causes physiological damage to a corn crop. Bob Nielsen from Purdue explains that young corn can survive 4 days of ponding if temperatures are below the mid-60’s °F, but if temperatures are over the mid-70’s °F, then corn survival will be less than 4 days. Thus, depending on the temperature it may not matter how much N has been lost, the corn crop may never fully recover even if supplemental N is applied. If all or most of your N for corn is coming from manure and/or a forage legume, then the PSNT can still be used to estimate N credits. Note, when average May-June soil temperatures are more than 1°F below the long-term average, the N credit is often underestimated and book value estimates of credits are more reliable. The PSNT is not suggested for use on sandy soils. 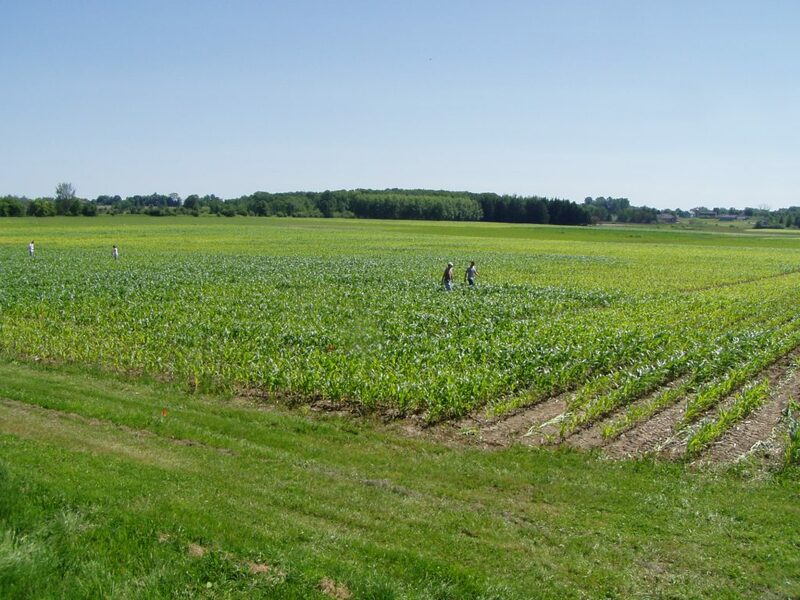 For more details on how to use the PSNT see UWEX Publication A2809 Nutrient application guidelines for field, vegetable, and fruit crops in Wisconsin (http://learningstore.uwex.edu/assets/pdfs/A2809.pdf). Where the entire crop N requirement has not yet been applied, sidedress or other postemergence applications should contain the balance of the crop N requirement. Additional N to replace 25 to 50% of the fertilizer N that was lost could be applied. If all of the N was applied prior to the heavy rainfall, try to determine how much N loss may have occurred. The next step is to decide whether or not you need or want to apply supplemental N fertilizer to your corn crop. When making this decision, compare the amount of N loss (in lb N/a) that you think may have occurred to UW’s price adjusted corn N rate guidelines at several different N to corn price ratios. (See UWEX publication A2809 for details). For each N:corn price ratio, UW guidelines have a target N rate, the maximum return to N rate (MRTN) and a range of N rates that produced profitability within $1/a of the MRTN. The profitable range of N rates will typically produce a yield that is more than 95% of maximum yield. Yield at the MRTN rate is 98 to 99% of maximum yield. Remember maximum yield is not the most profitable yield. Based the estimated amount of N loss, as well as your cost of production, you may not want to replace all of the lost N.
Options for applying supplemental N when it is needed include traditional sidedressing, late/pre-tassel applications, or fertigation. UAN solutions can be applied as a surface band or as a broadcast spray over the growing crop. Dry N fertilizers (urea, ammonium sulfate, or ammonium nitrate) can also be broadcast applied to the crop. Leaf burning from solution or dry broadcast applications should be expected. Appling the dry materials when foliage is dry will help minimize burning. Broadcast N rates should be limited to 90 lb N/a for corn with 4 to 5 leaves and to 60 lb N/a for corn at the 8-leaf stage. Under N deficient conditions, corn will respond to supplemental N applications through the tassel stage of development if the N can be applied. Recent research conducted at Marshfield, WI showed that 40 lb N/a as UAN applied 7 to 10 days prior to tassel was successful at rescuing yield, when preplant applied N was lost because of wet soil conditions. Are fall applications of N to winter wheat beneficial? Save the Date: Agronomy/Soils Field Day at the Arlington Ag Research Station will be held on August 28, 2019.